Cooking on the BBQ and enjoying dinner at the campsite is an RV tradition, and Bison’s new Airlighter super-hot torch makes igniting charcoal and wood a breeze. With an adjustable handle so you can stay safely away from the heat, the Bison shoots out a flame igniting coals in seconds. With no mess or lighter fluid to deal with, this is a great new way to get the job done. When the coals are lit, the Bison blows cool air so the device is quickly ready to handle without the risk of getting burned. 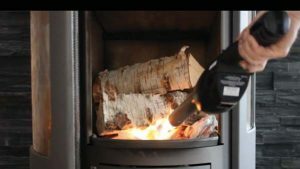 The lighter comes with a child safety lock and a light built into the housing that illuminates the coals or wood for nighttime use. The fan motor is run by an internal battery, which is charged with a USB cable. Fan run time approximately 30 minutes per battery charge. 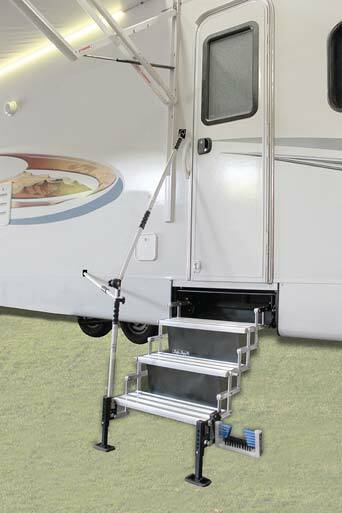 Torklift International invites RV enthusiasts to put their best foot forward with the new GlowStep Revolution, a step system that provides 7 inches of vertical step elevation adjustment and provides great stability. The steps fit on towable RV’s including 5th wheels, toy haulers and travel trailers. This versatile and flexible model adapts to any terrain. Steps glow in the dark for up to 10 hours and lock securely into the factory step compartment. Keep your RV clean with the DirtDestroyer shoe cleaning attachment. Backed by a lifetime warranty the original GlowStep for truck campers features a bolt on mounting bracket and is compatible with all GlowStep Series accessories. The Electric Tongue Jack from Stromberg Carlson has a 5,000 lb capacity and standard 18” of travel, plus an additional 5” drop down leg. This durable jack is backed by a two-year warranty and features two LED lights, a built-in leveller and an emergency crank. Why strain your back when you can hitch or unhitch your trailer in seconds by pressing a switch? The Stromberg Electric Jack bolts onto your trailer frame in seconds, using the same mounting holes as the standard manual jack. Wiring the jack into the trailer’s 12V electrical system is a very simple process – whether you install it yourself or have your RV tech do the job, this is one bolt-on accessory that every trailer owner should have. The experts tell us that if you have a 10% variance in tire inflation on a single axle, you can suffer a 25% increase in tread wear. This can cost a lot of money when your RV rides on tires that list at several hundred dollars each, in addition to risking overheating, poor handling, and possibly a blow-out at highway speed. The easiest way to travel worry-free is to install an A1A tire pressure monitoring system from Minder Research. Sensors built-into the tire valve caps send a signal that updates every four minutes to a receiver that mounts on your dash, providing visual readouts of the pressure in each tire and the A1A self-diagnoses every 5 seconds to instantly warn of unstable tire conditions. When a tire inflation problem arises, an audible warning sounds so you can attend to the situation before it gets out of hand. Under-inflation, over infla-tion, tire temperature – all of the information is dis-played on the monitor unit. If the tire temperature rises above 167 °F the alert sounds, and you can pull over to check the tire that is causing the problem. 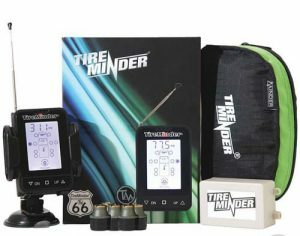 The Tire Minder system is simple to install and easy to understand. You can monitor the tires on your tow vehicle and trailer – running a dually with a triple axle fifth wheel trailer – no problem – there are Tire Minder models available that can monitor up to 22 tire posi-tions. Next articleNew Gear – Accessorize at your Campsite!